Melbourne is notorious for its alleyways and down The Walk Arcade in Causeway Lane, you’ll find the unassuming shop front (with a wicked, geometric logo) for Thaiger. Known previously for its burgers, Thaiger has launched a new menu that showcases authentic Thai influences with an urban and very Melbourne edge. Each of the dishes had an interesting fusion of traditional Thai flavours without being 100% authentic. This isn’t a critique though – the blend of cuisines made the flavours stand out and in a city that’s renowned for being multi-cultural, it’s pretty impressive to have a completely unique dish. From the entrée tasting board, the satay summer roll was the most memorable, thanks to the deliciously strong peanut flavour in the sauce. For the first time I’ve seen, the rice paper rolls didn’t have any of the traditional elements like vermicelli noodles or coriander so it was a treat to try some new flavours in the wrap. The Rice Bowls were served in the quirkiest metal pots, which came to the table stacked in two’s, connected by a frame with a handle. This presentation was not only incredibly cute, but it gave the dishes a hipster, Melbourne edge. Not to mention, was 100% Instagrammable! 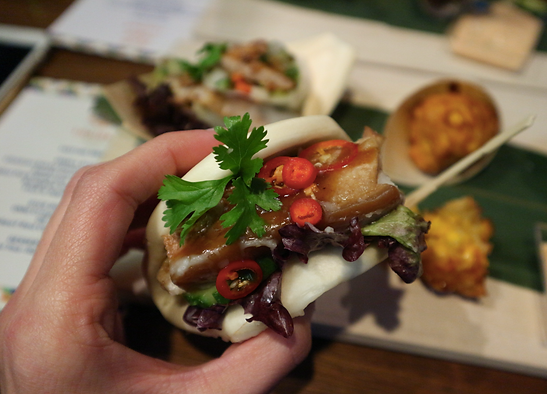 Of the two mains, the standout was the OMG Crispy Pork. Juicy and tender inside, crispy on the outside and had the perfect balance of sweet and spicy seasoning. Paired with freshly steamed rice, we polished off every grain from this pot. The dessert course was as impressive as everything that came before it, with more unique flavours and colourful presentation. The taro ice cream brought a nice sweetness to the sticky rice but the Tea-Ramisu was truly spectacular. Traditional sponge finger biscuits lined a glass and a creamy, tea-infused sauce was poured in to soften the biscuits into a pudding-like state. There wasn’t an obvious tea flavour, it was subtle and not overly sweet. Whatever blend it was, it certainly tasted delicious; the type of flavour that makes you keep going back for more. Again, I don’t know anywhere else in Melbourne serving Tea-Ramisu. The idea might confuse our Italian community but after the first spoonful, I bet even my Calabrese-born Nonna would be hooked! All the Thai cuisine classics are available, just not in the traditional way you’d expect. 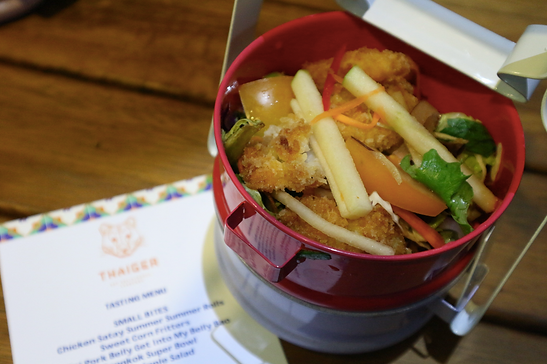 Thaiger has definitely broken out of its burger box and is ready to roar. For more restaurant reviews, check out Peaches & Push Ups and follow Juliana on Instagram @juliimare.